Our member in Norway, Kirkens Bymisjon (Church City Mission), has launched an innovative project that is creating both jobs and gifts by recycling wine bottles. The ‘Dråpe’ (Drop) project is being carried out by Church City Mission and is taking place in old industrial facility in Haugesund, in the West of Norway. The project is turning discarded wine bottles into vases, water carafes and candle holders to be given as a gift, or to be used at events. 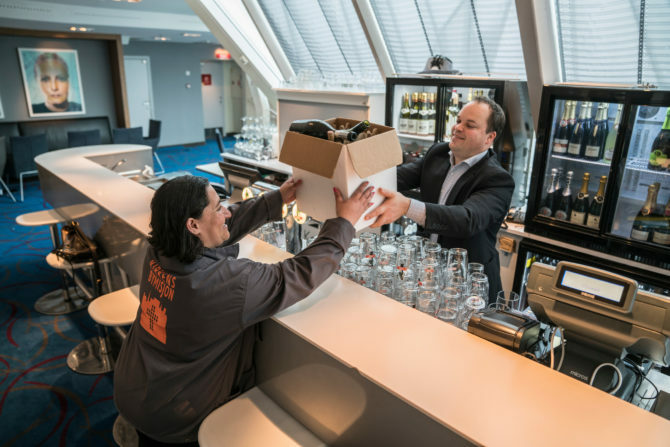 The project collects used wine bottles from restaurants, hotels and bars across Haugesund, and all partners involved are happy to be supporting the City Mission in their work, and feel the initiative is beneficial for the whole community. The team working to transform the used bottles have been overwhelmed by demand for their gifts, and are now producing over 150 bottles a week. The pre-Christmas interest in their products has been so high that their online store was temporarily sold out as many people rushed to get their hands on a bespoke gift that could be used as a vase or table decoration. As well a gifts, the Dråpe project has enabled many people who were struggling to find employment in the Haugesund to find work. The initiative collaborates with the local ‘LAR’ center for rehabilitation, and is allowing former addicts to get back to work and use their practical and creative skills in transforming the bottles. The project team are already thinking of developing the project to allow more people to work, through expanding their glass work to also transform discarded windows. You can learn more about the project on the Church City Mission’s website.